Peaches and Plums are in full bloom. They are everywhere, on the supermarket shelves, on fruitsellers carts on the by lanes and in my fruit vendor’s basket. 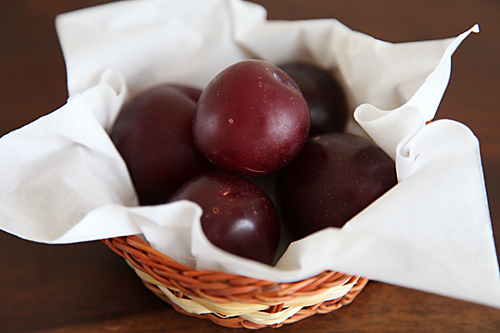 I love to eat Peaches and also cook with them and I prefer cooking with Plums to eating them raw. But what I love best is to make this crumble with my Peaches and Plums. 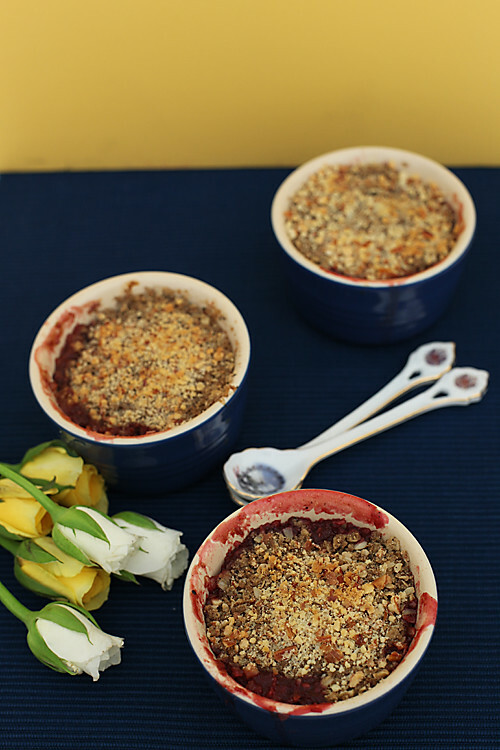 The colours of the cut fruit, the juices oozing out while baking staining my ramekin bowls in the process and savouring the warm crumble spoon by spoon is an experience that I fondly cherish. The best part of making a crumble is that it throws open innumerable options to give a vent to your creativity. You can practically use any fruit that you wish and top it up with your favourite flours, nuts and spices. I have used a mixture of buckwheat flour, rolled oats and plain flour with a hint of dry ginger and topped it up with finely chopped almonds. You could use amaranth flour or any other healthy flour like barley or just plain flour if you are feeling indulgent. Experiment with spices like vanilla, nutmeg or cinnamon and use nuts like walnuts or hazelnuts. Bake it in a single shallow dish or pretty individual ramekins. Let your creativity and imagination soar. The difference between a crumble and a crisp did cross my mind. My friend Shaheen has done a wonderful post on the comparison here. 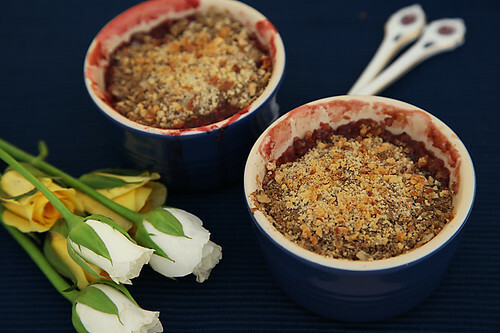 All I can say is a crumble is one of the best ways to eat your seasonal fruits with myriad possibilities. Eat it for breakfast, like how we do or served after a light brunch, lunch or dinner, warm from the oven with a scoop of vanilla ice cream it becomes a wonderful dessert. Remember I mentioned to you in my last post that I would reveal something to you now? Well, its done! I have been fortunate enough to travel and meet amazing people gaining varied life experiences in the bargain. What has made this even more fascinating for me has been the enriching journey of seeing the world through my lens. You can see all this and more here. I have been absconding for longer than usual this time. But life has been a roller coaster ride here, setting up this new website, guests and with my 16 month old baby Harivansh developing mild fever for the first time in his life. I have been playing the role of a paranoid mother to the hilt. But all is well now and life is slowly coming back to normalcy. In the meanwhile enjoy your crumble. I will be back soon with another delicacy! Like I said above, you can practically use any fruits in season and vary the flours used to make this crumble. If you don't have buckwheat flour, you can use amaranth flour or even plain flour. Lightly grease 4 ramekin bowls or a medium sized shallow baking dish with butter. Clean and stone the Peaches and Plums and cut them into bite sized pieces. Mix in the sugar and leave aside for 10 minutes to half an hour. This will allow the fruits to develop more flavour. Cut the butter into tiny pieces. In a large bowl assemble all the dry ingredients, the rolled oats, buckwheat flour, flour, baking powder, ginger powder, cinnamon powder and sugar and stir well with a spoon until the ingredients are well mixed. With a pastry blender or with your hands cut the butter into the flour mixture until it resembles corse bread crumbs. Chill this mixture in the freezer for about 5 to 10 minutes. Place the fruit into the individual ramekins or the shallow tin until they are 3/4th full. 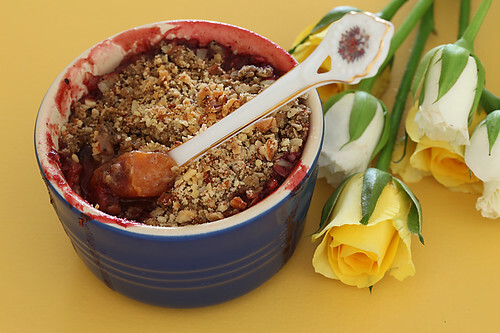 Put the crumble topping evenly over the fruit, sprinkle with the almonds and bake in a preheated oven at 190 degree Celsius or 375 degrees F for about 15 to 20 minutes or until the juices from the fruit ooze out of the crumble topping. Serve warm as it is or with whipped cream or vanilla ice cream. This looks wonderful. Such a luscious combination of summer flavor. I've never tried buckwheat flour but look forward to trying this recipe. I didn't know we get peaches in India.. This is amazing. And the dessert looks pretty and delicious. Beautiful! I like the use of buckwheat flour here. EL: You will enjoy the flavour and texture of buckwheat flour. RV: Peaches are available in all the major cities. Primarily grown in the Himalayas. I love peaches and plums. this is a must try recipe. The crumble looks delightful. Quite a coincidence that I got a kilo of peaches today to make some crumble! This is the third recipe I will be trying from your site – The first was eggless vanilla cupcakes. I loved it. I love all your recipes and keep a tab on your latest uploads on Rajshri Food channel. Kudos to u. I wish to know if we can replace peaches with canned ones if not in season?. Kadambari- Glad to know you appreciate my work. Yes you can use canned peach but fresh is best! 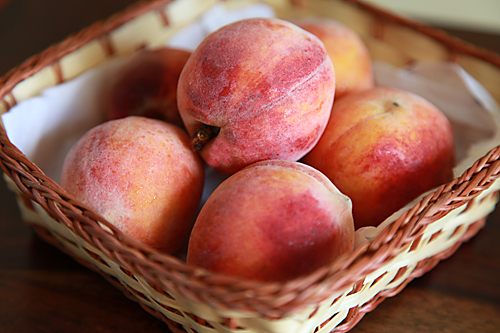 You can also substitute the peach with other seasonal fruits when you can't get peaches. Nice. I make them and grate the cold butter, works well. Next time I will try with ginger pd.